Systema ideale pyrophylaciorum subterraneorum (“Underground Fires”). 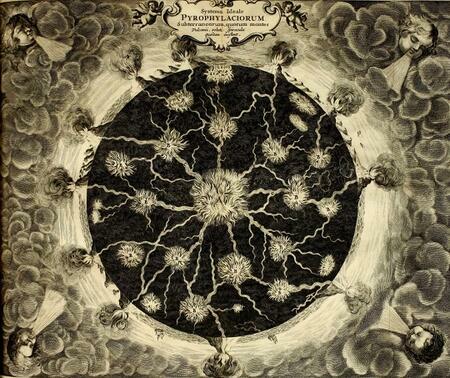 From: Athanasius Kircher, Mundus subterraneus, vol. 1, 2nd ed. Amsterdam 1678. Early modern scientific authors often contradicted prevailing opinions and disagreed with each other over crucial issues. If possible, they resorted to incontestable evidence or mathematical demonstration to decide the matter under discussion. But often, there was no hard proof at hand. In such cases, verbal persuasion was called for. Much has been written about theories of proof and persuasion in early modern science (R. W. Serjeantson, "Proof and Persuasion", in: K. Park/L. Daston, eds., The Cambridge History of Science, vol. 3: Early Modern Science, Cambridge 2006, 132–175). But little thought has been given to their rhetorical underpinnings, despite the well-known influence of legal thinking on scientific argumentation (e.g. L. Daston, "Baconsche Tatsachen", Rechtsgeschichte. Zeitschrift des Max-Planck-Instituts für Europäische Rechtsgeschichte 1 , 36–55) and despite the fact that rhetoric was first and foremost a technique of forensic speech. Analysis of how persuasion worked in early modern scientific practice has been confined to a few famous vernacular authors such as Galilei and Robert Boyle. These omissions will be rectified in the present sub-project.